This pocket chainsaw comes in two different versions. Without handles and a military version that has 550 cord as the handles. The without handles version fits nicely in the can and the large rings allow you to either use the fingers (which can get painful) or use a couple of strong sticks to use as makeshift handles (way easy and convenient). 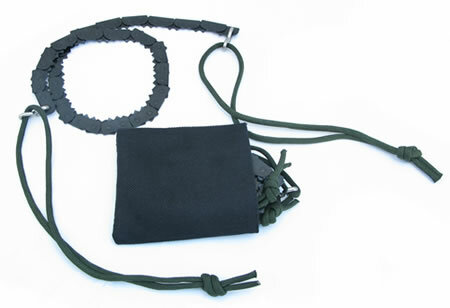 The military version uses pre-installed 550 cordage as handles and comes with a pouch to put it in. It is also shorter than the other versions. For survival kit purposes, we recommend the military version. WE ARE OUT OF THE VERSION WITH HANDLES. Picture below shows version with handles and without. NOTE: The handles do not fit inside the can. They have to carried separately outside the can. Take this into consideration when determining which version you want. Saw in can weighs only 5 oz. Military Version Below is a bit shorter with less teeth. However, more compact and just as effective. 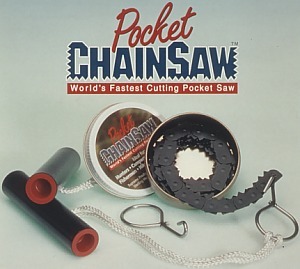 This Military Pocket Chain Saw is about as light and portable as a chain saw can get. At a mere 3.28 ounces, it’s light enough to go unnoticed amongst your other gear, and it packs down to 3” x 3.5” inside the included nylon pouch. The 22” flexible blade has 92 bi-directional cutting teeth, which means it cuts wood on three sides. Every little bit helps when you’re cutting by hand. 22” flexible blade saw with 92 bi-directional cutting teeth – tooth every ¼ inch (teeth are sharp on both sides) – cuts wood on 3 sides. Parachute cord “rope sling” handles. Weighs just 3.28 ounces (including saw and pouch) – pouch dimension (with saw inside) 2 7/8” x 3 1/2” x 3/4”. Heat treated to spring temper for long life and coated for rust resistance. Military Pocket Chainsaw shown below.